Robert Alai has taken a dig at Akothee claiming that she is doing hard drugs. The controversial blogger seems to have arrived at the conclusion after the controversial performance in London. About two weeks ago, Akothee’s dressing code and dancing style during her concert in London sparked uproar. The mother of five thrilled fans with her raunchy dances that included lifting one of her legs up high while wearing a body suit. Arbiters of moral correctness were quick to sound the alarm after Akothee paraded her nether regions during her performance at Wembley stadium. 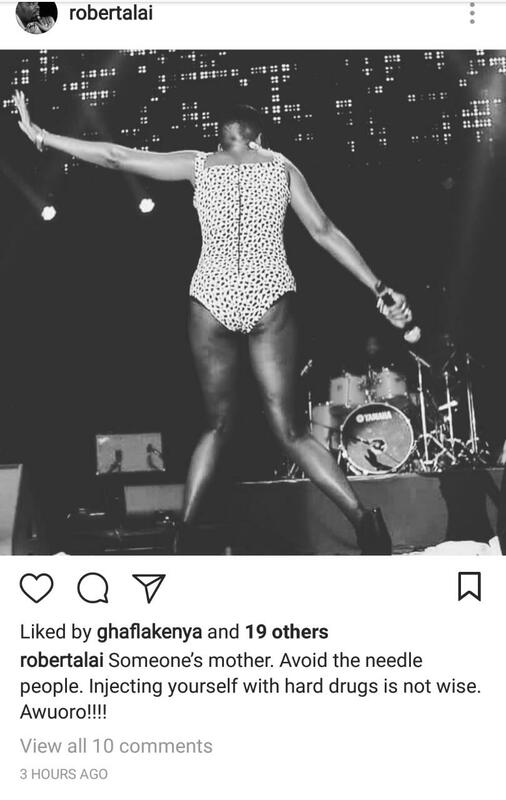 Robert Alai recently took to Instagram and shared a photo of Akothee performing in London, he captioned the photo with a message to Akothee. Alai claims Akothee is doing hard drugs. The controversial blogger further warned the singer to avoid injecting herself with drugs. “Someone’s mother. Avoid the needle people. Injecting yourself with hard drugs is not wise. Awuoro!!! !” Wrote Robert Alai.